Refugee and human rights organisations have criticised US President Donald Trump’s assessment of asylum seekers in his recent State of Union Address as “cruel” and “unprecedented in American history”. But several prominent US NGOs issued statements condemning the policy of ‘pushback’. 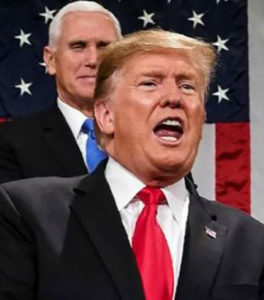 Amnesty USA spokesperson Joanne Lin said the address was “just another opportunity for the president to peddle his politics of hate and fear to a captive audience”. “He has emboldened despotic regimes around the world by turning a blind eye, and in some cases, actively promoting human rights violations in places like Saudi Arabia and North Korea,” Ms Lin said. “At the southern border (of the US), his obsession with divisive symbols like a wall is just part of his continued efforts to stigmatise people desperately in need of protection. His policy of sending vulnerable asylum seekers back to dangerous conditions in Mexico is nothing short of cruel. “No wall, no military buildup, no expansion of detention facilities, no pushbacks of people legally seeking asylum at the border. It’s time to come back to human rights and work for policies that treat all people and families with dignity,” Ms Lin said. While the Christian-based charity World Relief welcomed the President’s commitment to the security and well-being of Americans and his assertion that legal immigrants enrich the nation, it urged him to “pursue comprehensive, bipartisan immigration reform that retains border security while providing a process by which immigrants can earn legal status and, ultimately, U.S. citizenship”. “We agree that we have a duty to protect the lives and jobs of our citizens – but we also have a moral duty to care for the vulnerable,” it said, in statement. “While World Relief agrees that border security is important, we also have to respond in a humanitarian way to those who seek asylum in the US. It is counter to our nation’s legacy as a country of immigrants to restrict avenues through which those who are fleeing persecution and danger can find protection in the United States,” the charity said. World Relief President Scott Arbeiter urged the President to look at asylum seekers at the US border in context with the refugee crisis as a whole with 68 million people currently forcibly displaced around the world. “The world’s vulnerable are best served not by punishing them for seeking a new life but by offering clear, defined pathways to seek asylum and become integrated into the nation,” Mr Arbeiter said. During the State of the Union address, President Trump introduced two Holocaust survivors, including a man who escaped death again recently in the attack on the Tree of Life synagogue in Pittsburgh. One of the men, Judah Samet, whose 81st birthday was Tuesday, was four minutes late for worship one Saturday in October, missing one of the deadliest attacks ever on American Jews. Following the President’s speech, HIAS, the Jewish refugee resettlement agency that was the target of the Pittsburgh gunman, issued a statement rebuking the President’s policies. “Stories of Holocaust survivors are reminders that we should welcome the stranger and protect the refugee,” said HIAS spokesperson Melenie Nezer. “Making the US great means upholding our commitment to international law and asylum seekers,” she said. “Blocking people from applying at ports of entry and forcing asylum seekers at our southern border to remain in Mexico to await their hearing is illegal, dangerous and unprecedented in American history,” Ms Nezer said.